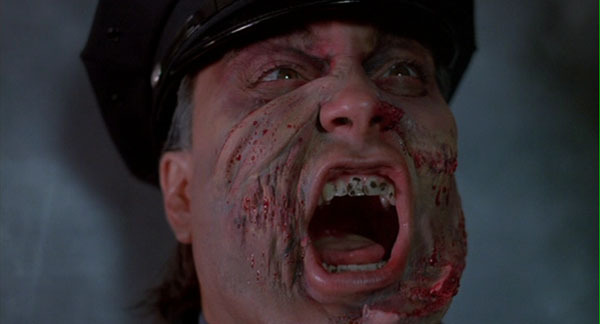 I knew a maniac cop once. His name was Clive; and he had a very strange tendency of arresting people that he didn't like the look of. He arrested Paris Hilton. He arrested Kim Kardashian. And he arrested Lindsay Lohan too. Heck, the only people he didn't arrest, was Director: William Lustig; and Actors: Bruce Campbell, Laurene Landon, Tom Atkins, and Robert Z'Dar. Especially in 1988, and for 85 minutes. Holy cr*p! Tell me it isn't true! 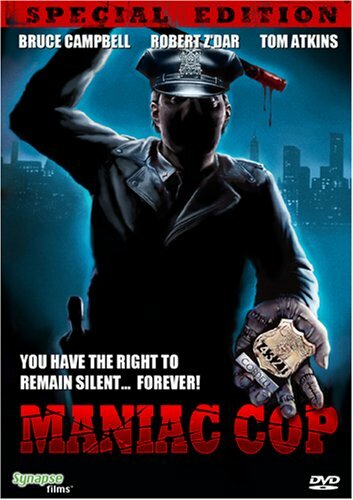 Please don't say that a maniac cop is going around New York City and killing people for the shear hell of it? Moreover, that when the Lieutenant who is assigned to this case, Frank McCrae (Tom Atkins), informs the media about this grizzly deed, that the public in turn fight back the only way they know how? Oh! So it's true then! But who could this killer be? No. Surely not Jack Forrest (Bruce Campbell)! Alright, I know that this good looking cop cheated on his wife just prior to her turning up dead. Still, he doesn't seem the type. Especially when you take into consideration that he has a very credible alibi during the time of this murder -- most notably, his lover come fellow police officer, Theresa Mallory (Laurene Landon). What? You're kidding me! The Mayor couldn't give a toss about this eye-witness? And that is why he instructs the police to lock Jack up for these crimes whilst he is still in uniform! Ouch. That's very sad news indeed. So what does Frank think about this arrest? Huh? He looks like a very nice chap too. And I bet you my bottom dollar that he will try his best to find out who the real killer is, no matter what this crooked politician might think. However, that's most probably why what next transpires throws a right spanner in the works, when Matt Cordell's name (Robert Z'Dar) comes under Frank's radar. As an accomplice makes a mistake - a criminal's face looks like chewed steak - revelations are hard to come by - and it's very hard to really do or die. Now have you ever seen that television series Angela Lansbury was in called 'Murder She Wrote'? It's not a bad program you know. At times it does tell a rather intriguing murder mystery of the quaint and evolving variety. OK, I have to admit, that if you have watched this show more than once, it is kind of obvious and formulaic by default. Nevertheless, it's still pretty good -- if I do say so myself. Furthermore, 'Murder She Wrote' reminds me of this movie -- 'Maniac Cop' -- where its conceptual pretext is concerned. For example -- a bad guy does something wrong -- a good guy gets blamed for this crime -- and an elderly super-sleuth tries their best to sort things out any which way they can. Granted, after the forty minute mark, this story does evolve into something completely different all together -- a story involving flashbacks, revelations, and a number of not so gruesome surprises just to 'enhance' the conceit of this piece. Yet, all the same, this comparison is still very valid nonetheless. And I feel sum's up what this production is like as an overall narrative. As for the rest of it on the other hand? Errr? How can I put this? The characters are of the 'cardboard cut-out' variety. The style is very 'eighties inspired'. And although I did find it suspenseful that the killers face was hidden for the majority of the time, in the same vein, that was the only suspenseful thing about it. Honest to God, for a sinister splatter movie I've seen more splatter on my nephews bib, and I've also seen him produce something more sinister from his posterior as well! Listen, I'm not trying to imply that 'Maniac Cop' was completely crap by any stretch of the imagination. Because its not. Rather, it's one of those late night films you might want to watch if there is nothing else on and your feeling somewhat restless. Damn! What a shame! Huh? 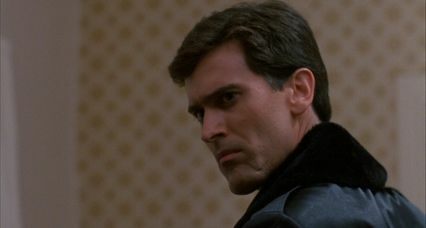 I'm a big fan of this genre of film; plus of Mister Chin himself, Bruce Campbell [click here for his section]. Also, I did enjoy the whole 'public verses the police' angle it was coming from too; and the idea of a good cop corrupted by the forces of evil and death. Its at times like these, though, that I'm reminded by what my very good friend, Mary-Anne, has told be about this type of flick in the past -- 'No matter what, both the victim and the hero play true to form come what may. They shouldn't go into that mysterious room, yet they go into that mysterious room. They shouldn't approach that big man with the knife, yet they go and approach that big man with the knife. Etcetera. Etcetera. Etcetera'. Anyway, before I get too maudlin with my b*llshit -- too late -- here are some nice filmic-facts for you, OK? (1) This slasher film was distributed by 'Shapiro-Glickenhaus Entertainment' on the 13th of May, 1988. And out of its $1,100,000 budget it was assigned, it eventually clawed back $671,382 at the box-office. (2) The scriptwriter, Larry Cohen, makes it a point of fact that his daughter, Jill Gatsby, stars in all of his film, and is killed in all of his films. Ha! Now isn't that fatherly love for you? (3) In real life the two main-movie protagonists -- Bruce Campbell and Robert Z'Dar -- both have the nickname 'The Chin'. (4) Did you know that there were a lot of cameo's in this movie? Spiderman director, Sam Raimi, plays a reporter. 'Raging Bull' boxer, Jake LaMotta, plays a detective. Mister Shaft himself, Richard Rountree, plays Commissioner Pike. 'Any Which Way You Can' co-star, William Smith, plays Captain Ripley. And the director of this flick, William Lustig, plays the Motel Manager too. (5) The man playing the Coroner in this adventure, Barry Brenner, is actually William Lustig's real-life doctor. (6) Upon its initial release this film was panned heavily by the critiques, stating that 'the filmmakers didn't do anything interesting or unexpected with its high concept plot'. (7) Including this one, it's a little known fact that William Lustig has produced / directed six films so far with the word 'Maniac' in the title. 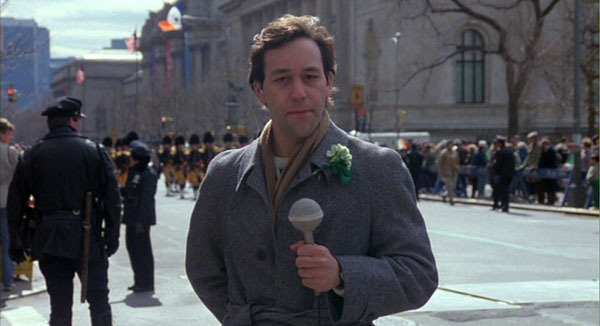 (8) Prior to production, Sam Raimi was a part of a team who shot the St Patrick's Day parade scene, so that the filmmakers could use it to secure some funds to 'complete' this film. All in all 'Maniac Cop' is one of those movies for people who like 'Murder She Wrote' with a twist, splatter without any depth, and their sinister without any girth. Yep. I'm afraid to say that it's a so-so film, dear reader, and could have been a lot better than it was. Shame.